At his coming, when he will have glory in his saints, and will be a cause of wonder in all those who had faith because our witness among you had effect in that day. and the word the power of God. Blessed, blessed be our Lord. 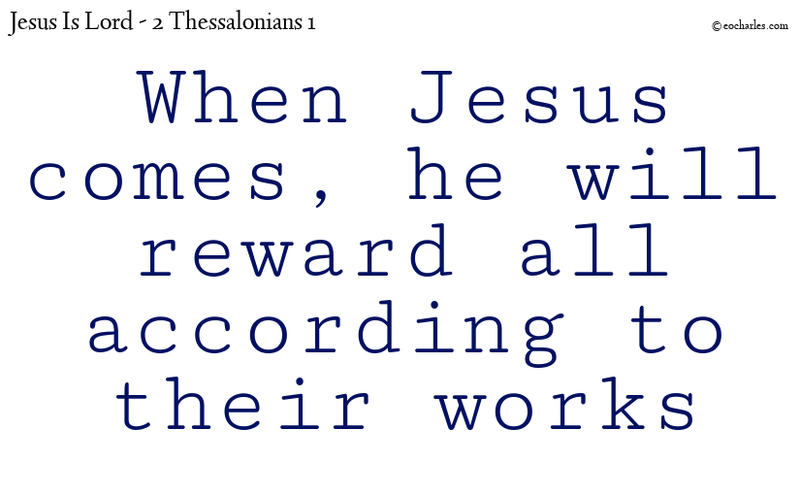 When Jesus comes, he will reward all according to their works. When Jesus comes, he will reward all persons according to their works. This is our Blessed hope, that after all the work we put in. That after all everyone has done, having faith, believing through the hearing of the word, having faith, having salvation, having kept up with it. Keeping up with it, keeping up with it. Sometimes the hardest thing is not to find Jesus, the hardest thing is to keep Jesus. After you found Jesus, you’re euphoric, you’re full of joy. Full of … well, “I’ve found the Savior”. But you still have to walk on. You still have to stand. You still have to go through tribulations. You still have that inner peace that he gives, but with trouble. My peace I give to you, but in the world you will have trouble. So, until he comes, and rewards all according to their works. Those who have faith, and have been patiently suffering, … the persecutions. And those who have not faith, and have been running amok on the world. All will get their reward, when he comes. That is our comfort, that is our comfort. Second Thessalonians 1 verse 10 At his coming, when he will have glory in his saints, and will be a cause of wonder in all those who had faith because our witness among you had effect in that day. will get their just reward. Know that when he comes, he will reward all according to their works. So rest assured, rest assured, be of certain hope. So make sure your works show your faith. Make sure you have faith. Look at it, salvation does not come by works, but by faith. But if you have faith, you will have works, it’s as simple as that. And if you don’t have works… well… show me your works, I’ll show you your faith. Blessed be our Lord, in Jesus mighty name, amen. Blessed be his hope, the hope that he gave us, that in the end. When he comes in clouds of glory, he will reward all for their works. The obedient with a blessing, the disobedient with a curse. Who’ll take us up to that new city, that New Jerusalem where there is no temple, but God and the lamb are the temple and where there is nothing that gives light, for God lights it and the light of it, is the lamb. So that glory may be given to the name of our Lord Jesus through you, and you may have glory in him, by the grace of our God and the Lord Jesus Christ. Blessed be our Lord, blessed be our Lord in Jesus mighty name amen. Jesucristo, La palabra de Dios.